Political history of Pakistan has always been marred with crisis. The period of political stability has always been short lived. Incumbent government led by Nawaz Sharif has been dealing with one crisis after another and the political crisis seems to be unending. Presently, the Nawaz government faces threats from two fronts; Imran Khan and Tahir ul Qadri. Imran Khan is raising the issue of rigging in last elections whereas Tahir ul Qadri wants to shake the entire system from its foundation while remaining in the ambit of constitution. One imagines how is that even possible? In such a delicate situation the news of rifts with ruling Pakistan Muslim League – Nawaz have also been confirmed. Government is utilizing all its energies in dealing with the political crisis and it’s understandable that it can’t concentrate on extremely important issues such as poverty, terrorism, electricity load shedding etcetera. Now, a question arises that how much is the contribution of ruling party, or ruling family to be precise, in the ongoing political crisis? The answer is pretty much. It’s a fact that last elections were massively rigged and PML-N has not done anything to clear that perception. It has not agreed to thumb verification in four constituencies as demanded by Imran Khan. Running away from thumbs verification and unceremonious dismissal of NADRA Chairman Tariq Malik, hint towards a cover-up job on the part of ruling part vis-à-vis election riggings. Whether one likes Imran Khan or not his stand on elections rigging is justifiable. Although Imran Khan waited for over a year to press for his demand but this delay can’t wash away the legitimacy of his claims. Furthermore, Imran Khan has announced a long march to federal capital Islamabad on the Independence Day 14th August. Government ministers are brushing off this announcement as an insignificant announcement but in reality they government is virtually shaking. In order to deter Imran Khan from going on with long march plans, Nawaz Sharif has invoked article 245 of the constitution and handed over security of Islamabad and other major cities to Army. This very decision is enough to read the paranoid mindset of Prime minister and his cabinet. The one and only thing which can pacify Imran Khan and his long march is acceptance of his claims of thumbs verification which government will never accept. According to analysts, if rigging is proved during the thumb verification process then the current Parliament will lose all its legitimacy what so ever. The politics of Imran Khan has never been exemplary. In fact he is the right person at the right time to raise the issue of election riggings. Let’s face it, the democratic system in Pakistan can never nurture if the elections are stolen through a rigged vote. Electoral reforms are must and the government has set up a parliamentary committee for that issue. However, it’s too little and too late. Everyone knows that traditional politicians never want fair and free elections as it doesn’t suit them. So expecting real electoral reforms from the parliamentary committee is naïve and unrealistic. The longer government delays the issue the more serious the political crisis will turn out to be. Moving on, Tahir ul Qadri poses the second biggest challenge for the political stability in the country. Tahir ul Qadri’s outbursts against the ruling family are completely correct but the problem is that Mr. Qadri himself is living luxurious life and he doesn’t have the required political power to create trouble for ruling party. However he can create trouble using his followers on the streets of Lahore and Islamabad. One thing must not be forgotten and it’s the nature of followers of Tahir ul Qadri. His followers are religious in nature and completely devoted to him. They will not run away in face of Police brutality as witnessed in Model Town Lahore last month. The political motives of Tahir ul Qadri aside, it was the government of Shehbaz Sharif which provided political mileage to Tahir ul Qadri by conducting a shameful act of state terrorism against Minhaj secretariat in model town Lahore. The combination of Imran Khan and Tahir ul Qadri would be fatal for the government. However, Imran Khan is not willing to join Tahir ul Qadri fearing that democratic system can be derailed and He would lose any chances of getting power. This acts as a plus point for Nawaz Sharif as two of his political threats have irresolvable differences for the time being. Nawaz Sharif and his government are responsible for the escalation of the political tensions in the country. If he had dealt the issue wisely and avoided brutal attack on Minhaj secretariat then situation would have been different. Nawaz Sharif is facing threats from every corner and the only way for him to survive is to face the situation bravely. Nawaz Sharif should agree on thumbs verification through a Supreme Court bench as demanded by Imran Khan. 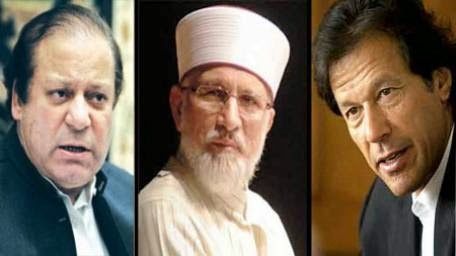 If Imran Khan is out of the equation then Tahir ul Qadri and his political allies would not be able to cause much trouble for the government. Even if the current political crisis settles down then in next four years a lot more such crisis are expected. The reason behind political crisis in future is not going to be the political opponents of Nawaz Sharif but his ego, inability to learn from the past and the desire to be an absolute ruler.